SUMMARY: Microsoft Windows 10 Version 1511 (Build 10586 and later) have a Unimodem problem that prevents voice modems from installing the Unimodem Full Duplex or Half Duplex Audio Driver. This prevents some TAPI Voice applications from properly detecting the modem as a proper voice modem, and/or prevent the modem from playing back any audio to the modem. The exception is voice software that uses TAPI ‘passthrough’ mode to communicate directly to the modem. If you are using a Conexant based voice modem please see additional notes below. 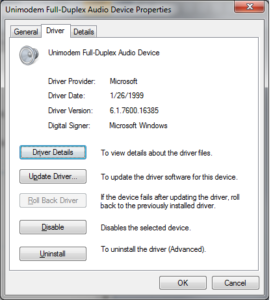 PROBLEM: If you updated from an earlier version of Microsoft Windows including Microsoft Windows 7, Microsoft Windows 8.x or Microsoft Windows 10 version 1507 (build 10240) to Microsoft Windows 10 version 1511 (builds 10586) or later, the Unimodem Full Duplex or Unimodem Half Duplex Audio driver for your ‘dialup’ fax/voice modem may no longer be installed in Windows. You can verify your version of Windows 10 by right-clicking Windows Start, Click Run, and type ‘WinVer’ (Or Windows Key+R and type WinVer and press Enter) also, you can check the properties of the Modem.sys file in your Windows\System32\Drivers folder. The properties should report version 10.14383.479 or later. NOTE FOR CONEXANT BASED MODEMS: If you use a Conexant based voice modem, some USB models will not be detected by Windows 10 as Voice compatible. The default Windows drivers will usually install these modems as a Conexant CX93010 ACF Fax Modem. (The modems have been identified with a PID of 1329,1340 and 1349) This driver is sufficient for faxing and data, but will not provide voice compatibility with some older TAPI compliant voice software. The Unimodem Full Duplex or Half Duplex Audio driver is not installed as this modem is not detected as a voice modem. Some specific USB models of Conexant voice modems (identified as PID 1329,1349) can be updated using Windows Update. The update will replace the existing Conexant CX93010 ACF Fax Modem driver and install a driver named USB Data Fax Voice Modem. 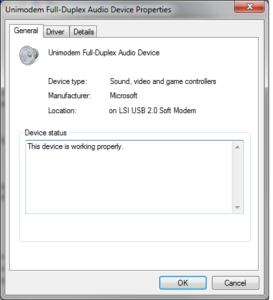 This driver is detected as voice compatible, so Windows will also install the Unimodem Half Duplex audio driver with the corrected Windows 10 update. To add to the confusion, an outstanding bug in the Windows Unimodem Tranform Module DLL (umdmxfrm.dll) prevents any audio to be played back with all these type of Conexant modems regardless of the modem driver you use above. The exception is TAPI compliant voice software that communicates directly to the modem using TAPI ‘passthrough’ mode. FaxTalk Messenger Pro will operate correctly with either driver listed above, with or without the Unimodem Audio driver installed. We tested the voice and fax functionality with FaxTalk FaxCenter Pro 9, FaxTalk Messenger Pro 9 and FaxTalk Multiline Server 9. All voice mail functionality is working normally without the presence of the Unimodem Audio Driver in Windows 10 version 1511 or later. Call screening and playback for incoming calls in voice mode is working. We have verified with Conexant USB Modems, MultiTech Modems using LSI/Agere chipset, and LSI 2.0 Chipsets.